Practical tips to boost your site conversions. SEO requirements keep changing, and it can be hard to keep up with the latest developments. But if you want your site to get traffic, you have to be in the know. In this guide, we’re going to share the essential SEO ranking factors you need to dominate search. By the end of this post, you’ll have a well-optimized site that brings you more business. Exclusive Bonus: Download the SEO Ranking Factors Cheat Sheet to quickly boost your search engine rankings. What Are the Most Important SEO Ranking Factors? Recommended Resource: Need more website traffic? 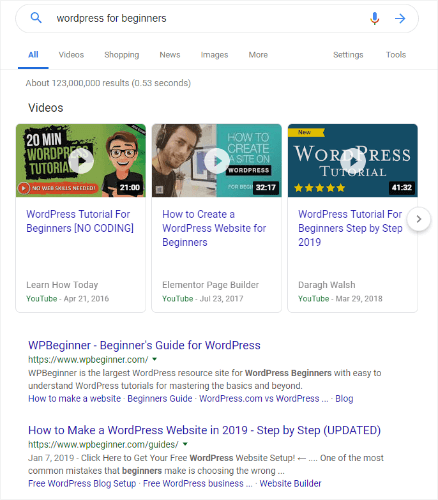 Learn how to rank #1 on Google with our Ultimate Guide to SEO in 2019. Before we get into the details of each ranking factor, let’s take a quick look at the basics of how search engine rankings work. Many people wonder how Google rankings work, so before we get into the actual search engine ranking factors, let’s get started by answering some of the basic questions most people have about SEO. What is “Ranking” in SEO? As you may know, SEO stands for search engine optimization, which simply means making the web pages better for search engine ranking, but how exactly does that work? In SEO, ranking refers to your content’s position on the search engine results pages (SERPs). 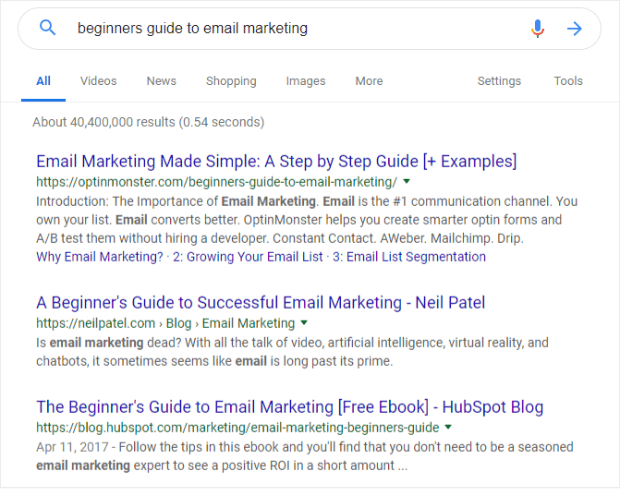 A #1 ranking means that when people search for a particular term, your web page is the first result (apart from promoted results, featured snippets, and answer boxes, which we’ll talk about later in this guide). Appearing in the top 3 results is excellent because almost half of the clicks on any search results page go to those positions. Appearing on the first page at all, within the top 10 results, is also useful. That’s because 95% of people never make it past the first page. What Does Google Look for in SEO? First, Google’s search bots (pieces of automated software called “spiders”) crawl the web… All that really means is they visit web pages. Second, they add correctly optimized and crawlable pages to Google’s index and catalog them. Third, when people search Google, it shows what it thinks are the most appropriate results based on the search terms they enter (out of the trillions of pages in Google’s index). At that point, you have to rely on your page titles and meta descriptions to get searchers to click your link and visit your site. 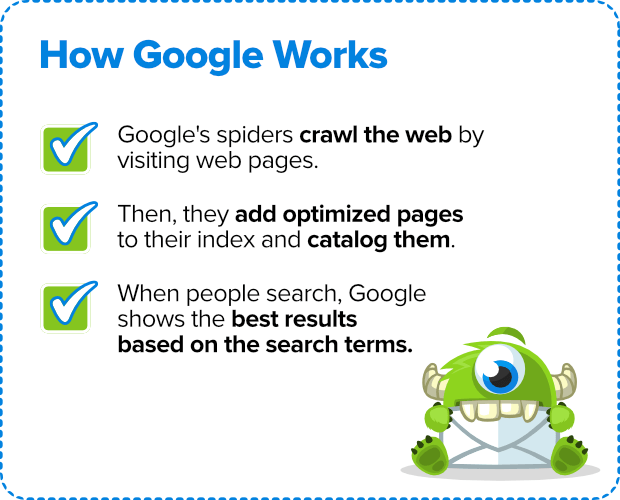 How Do Google Search Rankings Work? When people want to find information, they type or say words related to what they’re looking for. Those are called keywords, and we’ll look at those in the content optimization section of this guide. But search engine rankings are not just about keywords; they’re also about the quality of information. Expertise, authority, and trustworthiness – not just from the site and the page content, but expertise from the individual creator of the content too. These go into its ranking algorithm and help to determine SEO ranking. Based on the rating guidelines above, Google shows searchers the most relevant, high quality results related to what they’re looking for. The most relevant are shown first, with the rest being shown over successive pages. One of the goals of addressing SEO ranking factors is to let Google know when your pages on your site are relevant to particular search queries, so people will click the links and visit your site. Let’s be clear, though: there’s never a guarantee of a page one or #1 rank, and with SEO guidelines changing all the time, search engine rankings change with them. What is On-Page SEO and Off-Page SEO? Two terms you’ll hear mentioned a lot when talking about SEO ranking factors are on-page SEO and off-page SEO. On-page SEO refers to factors on your own website that you can optimize such as the underlying code and the content. Off-page SEO refers to actions taken outside of your site to affect your site’s trustworthiness and authority by building the right inbound links and social signals. Both types are included in the top SEO ranking factors. Before you can improve your SEO ranking, you’ll need to know your starting point. There are a couple of ways to find this. First, you could search Google using the terms you think your customers will be using. Use an incognito or private window in your browser, so the results aren’t skewed by Google’s personalization. See where your content appears. However, that’s totally impractical for established sites with hundreds of pages, so you’ll need a tool to do it for you. For example, with SEMRush, you can type your domain into the search box, wait for the report to run, and see the top organic keywords you are ranking for. Or, use their keyword position tracking tool to track the exact keywords you’re trying to rank for. See other keyword research tools in our guide. Now let’s look in detail at the top Google ranking factors for 2019. Unsurprisingly, the first of our SEO ranking factors has to do with having the right kind of URL. Specifically, that’s a URL that Google’s bots can easily reach and crawl. A sitemap, which lists all your pages. If you’re running a WordPress site, you can set up a sitemap via Yoast SEO. If not, then you can use an online sitemap generator. If you haven’t yet enabled SSL security on your website, get to it. Page speed has been cited as one of the main SEO ranking factors for years. Google wants to improve users’ experience of the web, and fast-loading web pages will definitely do that. Google announced a search engine algorithm update focused on mobile page speed that will start to affect sites from July 2018. If your site doesn’t load fast on mobile devices, then it could be penalized. 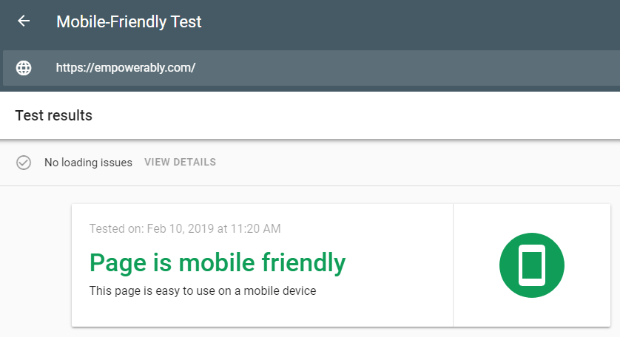 Use Google’s mobile testing tool to see how your site stacks up. And, if you’re using WordPress, check out these tips for speeding up a WordPress site from WPBeginner. 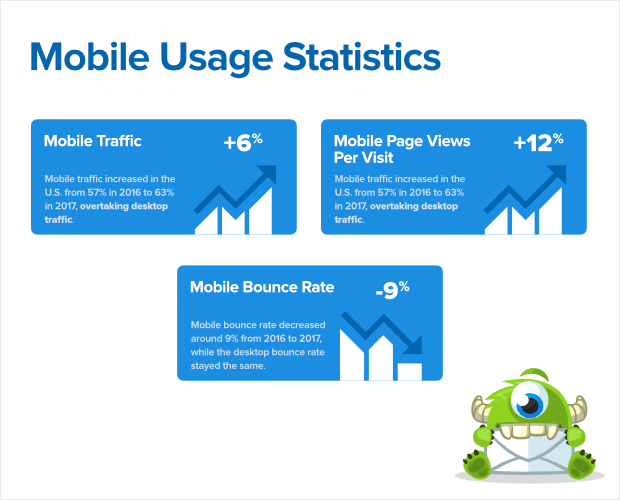 While we’re on the subject of mobile, mobile-friendliness is another major SEO ranking factor. More people use mobile devices than desktops to access the web, and that’s one reason there’ve been changes in how Google ranks search results. Google’s mobile-first index is now a reality, which means it’s drawing its results from mobile-optimized sites first, rather than sites geared to desktop computers. If your site isn’t mobile-optimized you risk being out in the cold, in SEO terms at least. Many of the SEO ranking factors we’ll look at in this article will help you lay the foundation for a good search engine ranking, but you also have to look after user experience when people land on your site. Get more tips on mobile-friendly design to improve Google search ranking in our guide to improving your mobile conversion rate. Did you know that nearly 60% of the sites that have a top ten Google search ranking are three years old or more? 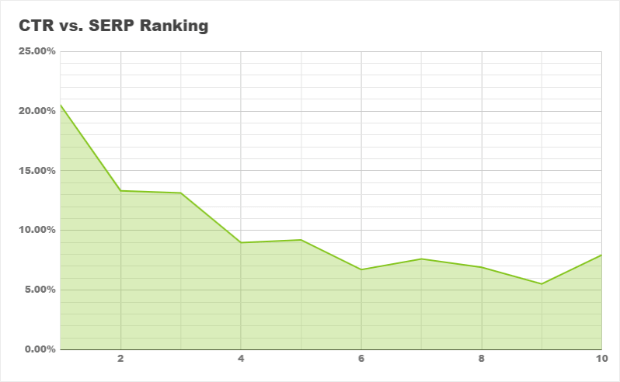 Data from an Ahrefs study of two million pages suggests that very few sites less than a year old achieve that ranking. So if you’ve had your site for a while, and have optimized it using the tips in this article, that’s already an advantage. In some cases, the domain name matters. Though Google has penalized exact-match domains (those where the target keyword is in the URL), that penalty is generally for spammy sites with thin content. Other research shows that exact-match domains that are deemed to be relevant, valuable, and high-quality can see a ranking boost because of it. However, if you already have an established website, you don’t need to go looking for an exact-match domain for your business; focus on a URL that reflects your business and optimize the heck out of it instead! When it comes to search engine ranking factors, authority matters. As you’ll see, that’s usually a combination of great content (see the next tip) and off-page SEO signals like inbound links and social shares. Moz has codified this into page authority and domain authority scores, both ranked from 0 to 100, which tell you how likely a particular page or domain is to rank in search results. You can check domain authority or page authority with Open Site Explorer. Just plug your URL into the onsite search box, and you’ll get a report showing domain authority, page authority, established links, and new links. We’ll look more at linking practices to improve SEO ranking in tip #8. We’ve talked a lot about content in this guide to Google SEO ranking factors. That’s because it’s one of the most important search ranking factors (right up there with user experience, links, and RankBrain, which we’ll get to in a while). 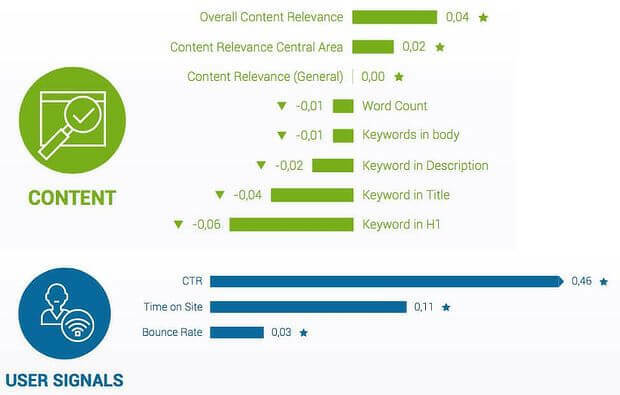 Now let’s dig down and see what optimizing content for SEO really means. As we said in our keyword research guide, Google’s search algorithm relies on keywords. These are the words and phrases searchers use when they’re looking for information. They’re also the words and phrases that describe the topics your site is about. Ideally, those will match up. That’s why it’s so important to use keywords in your content. One negative SEO ranking factor to be aware of is duplicate content. For SEO, fresh, original content is always best. And if you do have content that’s similar, tell Google which one should be ranked as most authoritative by using canonical URLs. It’s not just about the main keywords either; it’s also important to include terms related to the main terms people are searching for. These are called LSI (latent semantic indexing) keywords. They provide a kind of online word association to help Google know which results to show. 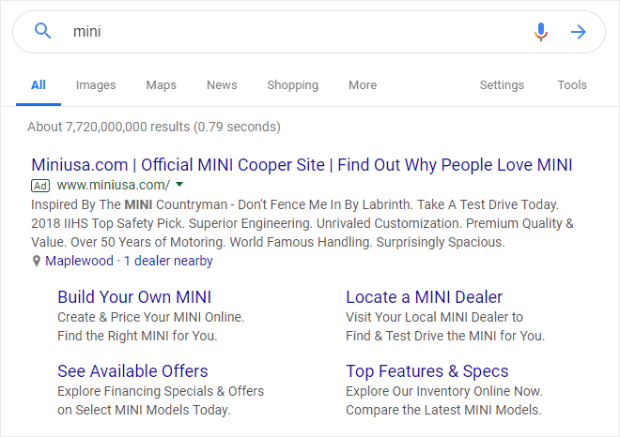 For example, using the right LSI keywords will tell Google that when searchers type in “mini”, your page is relevant to the car, rather than the skirt, and vice versa. Learn more about how to find and use LSI keywords here. It’s worth noting that as more people search by voice, content optimization includes optimizing for questions and natural language searches. Here’s an important point, though: keyword stuffing is absolutely outlawed because it will result in poor quality web pages and will actually hurt your SEO ranking. Search intent is also important when optimizing content. That means understanding what people are really looking for when they type in search keywords. For example, let’s say you’ve identified “florida real estate” as a keyword you want to rank for. You might think that writing content for people looking for real estate in Florida is a good idea. But if the people searching for that term are realtors looking to sell too, then your content won’t meet their needs, and your page won’t rank. Sometimes, it’s clear what people are looking for. For example, if they use the word “compare”, they’re likely trying to make a decision about buying a product. And if they use the word “buy”, then they’re looking to make a purchase. Well-optimized business sites will include content for each of those search types. Learn more about keyword intent here. 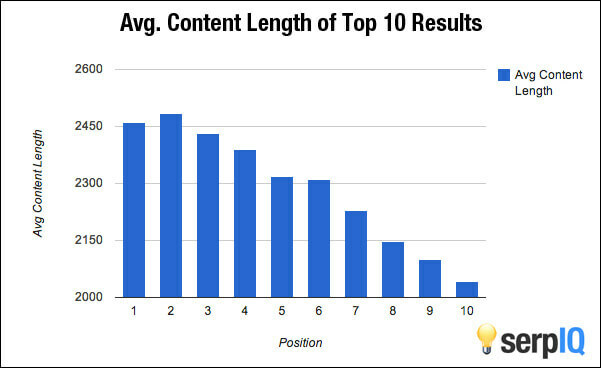 Is Content Length an SEO Ranking Factor? In a word, yes. Google wants content to be quality and have some length to it. While writing more just to stretch out the length is never advisable, if a subject calls for depth, give it depth. The research suggests that content over 2000 words gets more top ten positions in Google search engine rankings. Longer content attracts more links and shares too, which are 2 other important ranking signals. According to Cisco, video content will represent a whopping 80% of online traffic by 2021. Definitely start to include video in your content strategy. Video gets read, shared and linked to, providing plenty of signals to amplify your search ranking. Use keyword phrases in page titles, which is where Google first looks to determine which content is relevant to which search. You’ll see the page title as the first line of a search result entry. Use header tags to show content hierarchy. If your title is formatted as h1, then use h2 or h3 for subheads. Create a meta description that both entices readers and includes your keyword phrase. Keep meta descriptions short and grabby – you have right around 160 characters to convince searchers that this is the post they want. Use keyword phrases in image alt tags to show how the images are relevant to the main content. Google also has an image search, which is another way for people to find your content. Where it’s appropriate, use schema markup to tell Google what kind of content you’re producing. This can also help your content appear in rich card entries other than answer boxes. Dwell time – how long they stay on your site after they’ve arrived. If people land on your site, don’t like it, and bounce away, then Google will think it’s not relevant to their needs. If enough people do this, then you might find it more difficult for your site to rank higher in search results. In contrast, if people click through to your web page and stick around for a while, that tells Google your content is relevant to their search. So when you optimize titles, descriptions, and content to get the clicks and deliver value on the other end, you can boost your search engine ranking. Google uses inbound links as one way to help determine how authoritative and relevant your content is. The best case scenario is where an authoritative site includes a relevant link to your site in a relevant piece of their content. So, if the Content Marketing Institute includes a link to your content marketing resource, that’ll be perceived better than if a random person with a low quality site links to it. Ideally, you want to have very few inbound links from low-quality domains. You can find your inbound links using a tool like SEMRush or one of the keyword research tools shared earlier in this guide. At the same time, you want to show that you’re creating quality content for your visitors and linking to relevant, authoritative sites in your niche is a good thing. Finally, linking to your own content can help tie pages together for both Google and your visitors, making each page more valuable. If you have an authoritative page and link to another page on your site, that helps visitors find the other page and passes on some of that authority. That will help that second page boost its search engine ranking. Related Resource: See The Ultimate Guide to SEO Link Building to learn the tricks & techniques the experts are using to build quality links. When people share your content on social networks, that’s another sign that it’s valuable. 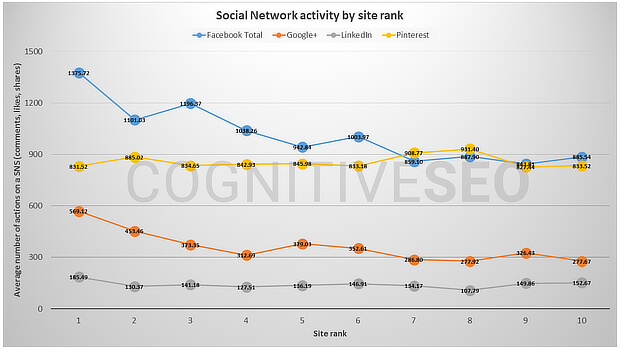 Cognitive SEO‘s study of 23 million shares found a definitive link between social shares and search engine ranking. Google’s official word is that social shares are not a direct ranking factor. Links from Twitter or Facebook aren’t counted the same as links from other authoritative websites. Still, there’s no denying that the highest ranking pages in Google search results usually have a lot of shares – probably because the more your content is shared, the more people will see it and decide to link to it. That means that getting more social shares does help your search engine rankings, if only indirectly. Not only do you need to have a social media presence yourself, but you need to make it easy to share your content and amplify those social signals. We have some great tips for doing this in our guest blogging guide and guide to growing your email list with social media. This tip is important for businesses targeting particular local areas. The presence or absence of business information is one of the most crucial local SEO ranking factors. Jacinda Santora is a writer specializing in ecommerce and growth marketing. She prides herself on her ability to make complicated things easier. When she isn't writing you can find her daydreaming about campervans, drinking coffee, and listening to podcasts. Thanks for reading this article – I hope you found it helpful. I wanted to let you know about our powerful Exit Intent® technology that converts abandoning website visitors into email subscribers and customers. Typically 70% of the people who visit your website will leave and never return, meaning all those marketing efforts to reach them have gone to waste. 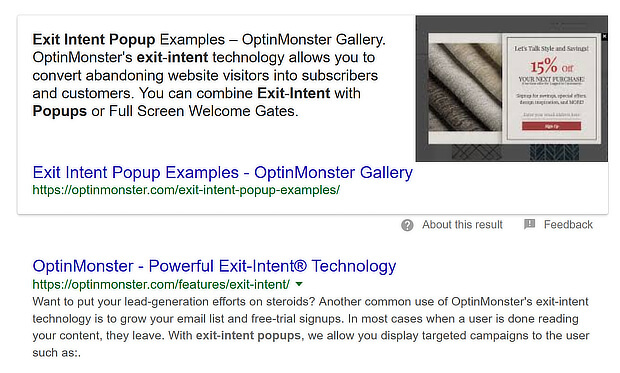 OptinMonster’s Exit Intent® technology detects user behavior and prompts them with a targeted campaign at the precise moment they are about to leave. You can unlock this powerful technology 100% free when you purchase our OptinMonster Pro plan. Get started with OptinMonster today and see why 700,000+ choose OptinMonster to get more subscribers and customers. A well written and interesting article, thank you. Now I will have to make time to go through this and apply it where I can. Hey Sharon, great post! Re. dwell time – I’ve read conflicting opinions, some saying that Google DOES consider it an ‘important’ ranking signal, and others saying that it doesn’t, because dwell time can sometimes be a misleading indicator of content quality. For example when a user searches for something specific and finds the answer immediately in the recommended page (meaning that the content on the page is actually spot on) so he returns to the SERPs very quickly. I have been unable to locate any definitive statements (written/spoken) from anyone at Google that suggest that dwell time IS still a factor in ranking considerations, but it makes sense (to me, anyway) that it should be. Do you have any ‘proof’ one way or the other re. whether Google definitely considers dwell time or not? 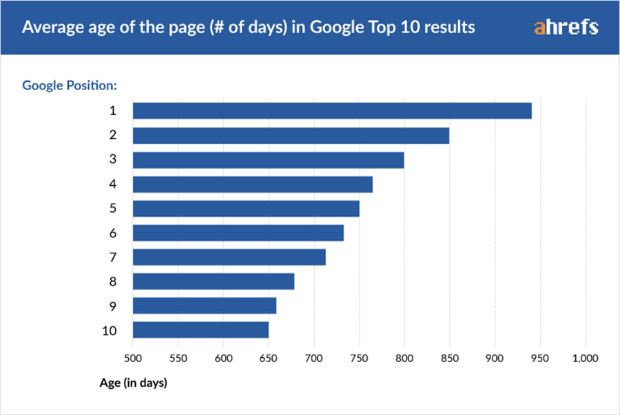 Hi Noya, all the info suggests that dwell time IS taken into account in search ranking, and we know that Google measures time on page and bounce rate in Analytics, too. Plus the search engine gets smarter all the time. With the machine learning component of RankBrain, we wouldn’t be surprised if Google can tell the difference between sites where visitors stick around, bounces where the visitor gets an answer immediately, and bounces where the visitor keeps searching. Join 700,000+ who get more subscribers and customers with the power of OptinMonster. Ultimate Guide to Single Optin vs. Double Optin – Which One is Better? Email Marketing vs. Social Media: Is There a Clear Winner? Unleash the power of OptinMonster on your website today! Copyright © 2013 - 2019 Retyp, LLC. OptinMonster®, Exit Intent®, OnSite Retargeting® and OnSite Follow Up Campaign® are registered trademarks of Retyp, LLC.